The home and studio of New Mexico artist, Georgia O’Keeffe has reopened for tours, for the season! Guests at Casa Escondida B&B will find that O’Keeffe’s home and studio are a stunningly beautiful, 40-minute drive from our Santa Fe area bed & breakfast, which is located in historic Chimayo, NM. 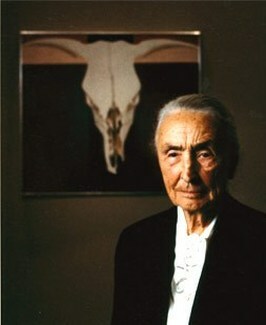 If you are an O’Keeffe fan, then a tour of her home and studio is a must! Many visitors mistakenly believe that O’Keeffe (1887 – 1986) lived in Santa Fe. She did not. The Georgia O’Keeffe Museum is located in Santa Fe. However, her home and studio are actually located in the village of Abiquiu, New Mexico. Abiquiu is what many refer to as “O’Keeffe Country”. This is where Georgia created countless paintings that were inspired by the picturesque landscape of northern New Mexico. If you are at all familiar with her paintings, you will certainly reconize the landscape upon your arrival in Abiquiu. One of her most favorite subjects was her beloved “Cerro Pedernal” (mountain), which she painted in many of her most famous works. Georgia’s home and studio remain exactly as they were at the time of her death. The O’Keeffe Home and Studio Tours are limited to only 12 people per tour, at a cost of $35 – $45 per person. During peak season, many dates will sell-out. As a result, Casa Escondida B&B highly recommends that you book your Georgia O’Keefe Home & Studio Tour far in advance. These guided tours are about 1-hour in length. Watch and listen to Georgia as speaks about herself, her paintings and her New Mexico in this YouTube video. 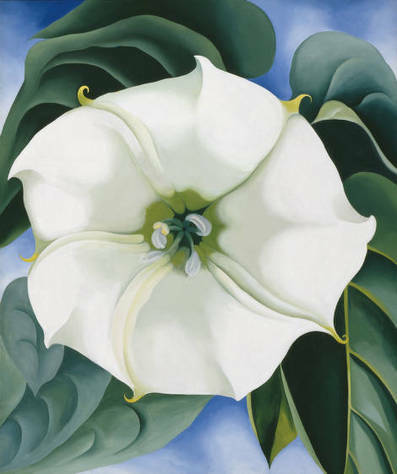 During your stay at Casa Escondida B&B, be sure to take-in the newly opened exhibit, “Georgia O’Keeffe and the Faraway: Nature and Image” at the Georgia O’Keeffe Museum in Santa Fe. 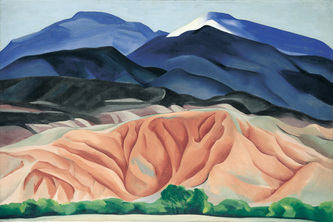 O’Keeffe took many camping trips throughout northern New Mexico during her lifetime. This exhibit is the first to demonstrate how the beauty and elegance of her paintings were in part, formed by her experiences with the Southwest’s natural forms. Georgia O’Keefe Museum Tours are also availble. The museum exhibit runs through May 5th of 2013. The staff at Casa Escondida B&B are delighted to assist you in planning your O’Keeffe outing.